Guide the chimp in this puzzle platformer to get items for various Nitrome games. Play Now! Once again, the kingdom calls for warriors to join the royal league. With more unit classes, quests and events! Play Now! Upgrade your rocket and send it into space! Play Now! 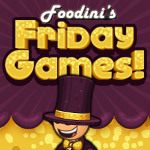 ← Quinn’s Q&A: Order Speed, Foodini, and Hot Chocolate!